At least 49 percent of Brazil’s soy trade is covered by some type of zero- deforestation commitment. Consequently, soy producers involved in deforestation face increasing market access risk. Traders have more advanced ESG policies and lower risk exposure than producers. The large-scale expansion of soybean cultivation in Brazil has been identified as one of the key drivers of deforestation in Brazil in the last 20 years. While the 2006 Soy Moratorium has helped to weaken the relation between deforestation and soy cultivation in the Brazilian Amazon Biome, other highly biodiverse and carbon-rich eco-regions – such as the Cerrado and the Gran Chaco – have still been converted to cropland at a rapid pace. Public awareness of the role of soy cultivation in deforestation in the Cerrado has grown recently, including among soy traders, consumer facing companies and financiers. This paper explores the existence and extent of market access risk and financial consequences in the soy supply chain due to weak sustainability performance. At least 49 percent of Brazil’s soy trade is covered by some type of zero- deforestation commitment. This figure may soon reach 57 percent. This compares to 74 percent in Southeast Asian palm oil refining capacity that is covered by zero- deforestation commitments. These pledges are not yet adequate to prevent the conversion of natural habitats, as the focus lies on eliminating illegal deforestation from supply chains. Accompanied by insufficient transparency and a limited scope of sanction mechanisms, traders still accept soy linked to legal deforestation. This is an issue in the agricultural frontier areas of the Cerrado. Investors have a high likelihood of low severity risks from non-performing loans, reduced interest incomes, reduced access to funds, worse solvency position and financial and reputational damage that could lead to value loss. The global soybean cultivation area has almost doubled during the last 20 years. It grew from 62.4 million hectares (ha) in the market year 1996/97, to 120.3 million ha in 2016/17. The market for soybeans and derived products reached a global value of USD 146 billion in 2017. It is expected to grow to USD 216 billion by 2025. Most soybeans are processed by being crushed into two main products – soybean meal and soybean oil, with soybean husks as by-products. The average crushing ratio for soybeans is 78.5 percent soybean meal and 18.5 percent soybean oil. Soybean meal is used as a highly nutritious ingredient in livestock feed. The oil is typically used as a cooking oil, as well as in cosmetics, detergents, industrial products, biodiesel and animal feed. Side products such as soy lecithin or soy flour only account for small amounts of the overall volume of soy and soy-derived products. Brazil’s role as a leading global soy producer has quickly evolved. During the last 25 years, the cultivation area in the country more than tripled, from 9.7 million ha in market year 1991/92 to 33.9 million ha in 2016/17. The same year, Brazil caught up with the U.S. as the largest global soy producer (Figure 2). Figure 2: Global soy cultivation area (million ha). Source: USDA. Figure 3: Supply chain of Brazilian soy, 2016/17. Source: USDA. In 2016/17, Brazil produced a total of 114.1 million tons of soy. A large share of this volume was exported (Figure 3). In total, 26 percent of the overall consumption of the key soy products was domestic, while 74 percent went to exports. The majority of Brazilian exports (81 percent) consist of soybeans that are crushed at their export destination. Soybean meal accounted for 18 percent of total soy volume exported. Soybean oil is largely consumed domestically, while 15 percent of the produced oil went to exports. China has become the single largest importer of soy products from Brazil, followed by the European Union (NYSEARCA:EU). China’s increasing demand for oilseeds continues to outpace domestic production. Total exports of soybeans, soymeal and soy oil from Brazil increased from 29 million tons in 2001 to 67 million tons in 2016. During the same period, China’s share as the largest customer of Brazilian soy exports increased from 11 percent in 2001 to 67 percent in 2016. The EU countries together accounted for 19 percent of Brazilian soy exports in 2016. Figure 4: Key exporters and export destinations of Brazilian soy, market year 2016/17. Source: Panjiva. Key soy certification standards of environmental and social sustainability performance are ProTerra and the Roundtable on Sustainable Soy (RTRS). Despite the various sustainability challenges in soy production, the share of certified soy under these certifications is still very small, reaching 1.6 percent and 0.6 percent, respectively, of global production in 2015, both mostly in Brazil. The origination, crushing and trading of soy and soy derivatives from Brazil are marked by a high degree of concentration and internationalization. A handful of processors and traders dominate the market for soy and soy derivatives. Shipment data suggests that the six largest exporters alone were responsible for 55 percent of soy exports in market year 2016/17. The top 15 traders controlled more than 76 percent of exports of soybeans and soy-derived products from Brazil to the world. 14 percent of exports are linked to unidentified shippers. Many small exporters with shares of 0.5 percent and below made up the remaining ten percent (Figure 1). The rest of the supply chain is highly fragmented due to the wide variety of uses of soy products. Traditionally, the trade of soy from Brazil was dominated by the so-called ABCD traders – ADM (U.S.), Bunge (U.S. / Bermuda), Cargill (U.S.) and Louis Dreyfus Company (LDC) (Netherlands). Brazilian traders like Grupo André Maggi (Amaggi) and Coamo Agroindustrial held smaller shares. In recent years, Asian commodity traders have quickly gained ground. They evolved from clients of the ABCD traders to competitors. This refers particularly to COFCO (China) and subsidiaries of large industrial conglomerates from the resource-poor Japan, including Marubeni, Mitsui & Co, Mitsubishi and Itochu. COFCO has rapidly increased its market share in the last years and is now among the top-5 exporters from Brazil. This expansion was accelerated by the acquisition of Nidera (Netherlands), finalized in 2017, and Noble Agri (Singapore) in 2016, both with considerable assets in South America, including Brazil. Other Asian players with smaller shares in soy exports from Brazil include CJ Group (South Korea) and Wilmar (Singapore). The ABCD traders are not involved in upstream soy production in South America but focus on origination, processing and trading. The ABCD traders as well as Amaggi have also made considerable investments in transport and export infrastructure in Brazil and some of them also provide financing to farmers. In contrary to this focus on midstream activities by the leading international players, two of the Japanese traders significantly invested in upstream assets and became also involved in agri-commodity production in Brazil. Agrícola Xingu operates as a subsidiary of Multigrain Trading, in turn a subsidiary of Mitsui & Co. Mitsubishi is producing soy and other agri- commodities with its subsidiary Agrex do Brasil. Based on the available shipment data, we cannot assess how much of their subsidiaries’ produce is imported to Japan by the parent company. Soybean production has been one of the key drivers of deforestation in Brazil in the last two decades, leading to significant deforestation and biodiversity loss, as well as substantial greenhouse gas emissions. While Amazon deforestation remains a concern, the interrelation between Amazon deforestation and soy expansion has been substantially weakened through the Amazon Soy Moratorium. It was established in 2006 and indefinitely agreed upon in 2016 by a range of stakeholders from industry, government, and civil society. The new agricultural frontier in Brazil has moved into the less developed areas of the Cerrado in recent years. The Cerrado is an environmentally sensitive forested savannah rich in biodiversity and important for carbon sequestration. 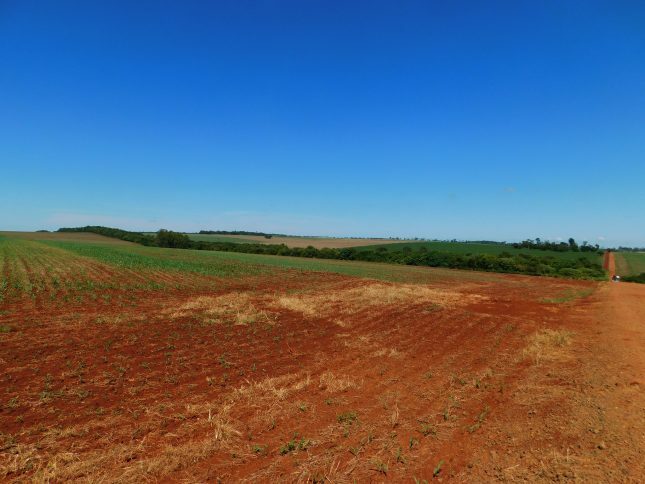 Large parts of the Cerrado have been converted for agricultural use during the last decades, namely soy, as well as corn, cotton, and other commodities. The remaining forested area is largely unprotected and therefore threatened by the ongoing conversion for commodity production. Environmental and social issues connected to the large-scale conversion of Cerrado land for agricultural use have also arisen due to the increasing land speculation in the area. This is based on a business model that aims to produce value from appreciation by acquiring land, clearing it from its native vegetation, transforming it into farmland, and selling it off. Significant additional conversion of new cropland is projected to be required in Brazil in the coming years. With an anticipated increase of over six million ha in soybean area until 2025 to satisfy the ongoing increase in global soy consumption, Brazil is expected to show the greatest expansion of cropland for the oilseed globally. Policies on environmental and social responsibility provide important insights into the commitments of companies to becoming more sustainable and responsible in their business conduct. However, policies are only valuable if fully implemented on the ground and accompanied by full transparency, a clear timeline and progress reporting. At least 49 percent of the Brazilian soy export market is covered by a commitment to tackle deforestation. Six of the top 15 soy traders have some commitment to zero- deforestation that covers their soy supply chain, representing a 49 percent share of the soy export market. LDC announced a soy-related ‘non-deforestation’ policy for 2017, which would bring the share to 57 percent. This includes generic pledges covering agri-commodities more broadly, or commitments that specifically mention soy. These have largely been developed during the last two years, suggesting that a fuller transition to zero-deforestation commitments among soy traders and processors may not take much longer. A detailed policy analysis has been conducted for the six largest soy exporters from Brazil in 2016/17 (Figure 5), based on a selection of key indicators in relation to environmental and social performance in the soy supply chain (see the Appendix for the methodology). There is a considerable variation in the level of commitments between traders, and important gaps in the policies remain. Figure 5: Analysis of public ESG policies of soy traders. Cargill, ADM, Bunge and COFCO all have environmental and social governance (NASDAQ:ESG) policies that specifically refer to deforestation and soy as a forest-risk commodity. Grupo Amaggi and Louis Dreyfus Company (LDC) have more generic ESG guidelines with reference to deforestation. This may change for LDC if it indeed publishes a recently-announced soy-specific policy. The traders support different initiatives aiming to curb deforestation. All profiled companies support the Amazon Soy Moratorium. In September 2017, Bunge together with ADM, Amaggi, LDC and a group of other stakeholders launched Agroideal, a decision-making tool currently covering the Cerrado that aims to facilitate an expansion of soy production in go-areas that meet environmental commitments. No burning (in agriculture).”In excluding HCS and HCV areas in relation to soy ADM goes further than some other traders. However, it does not fully exclude degradation and conversion of forests and other natural habitats. Cargill is the only leading soy trader that signed on to the New York Declaration on Forests. However, Cargill deviated from its original pledge of eliminating deforestation from the production of agri-commodities, including soy, by no later than 2020 to a commitment to “[…] eliminate deforestation across our entire agricultural supply chain, halving it by 2020 and ending it completely by 2030.” The company does not want to speak of a ‘zero deforestation’policy, as its “[…] aim is to ensure a balance between healthy agricultural systems, healthy forest ecosystems and healthy communities. […] [we] prohibit production on illegally deforested land anywhere in our supply chains […]. [O]nce illegal deforestation is under control, we can take steps at tackling the issue of legal deforestation.” Legal deforestation, like for example in the Cerrado, is thus not specifically excluded from Cargill’s supply chain. Bunge states it is committed to creating deforestation-free value chains, including for grains and oilseeds. Bunge does not explicitly exclude the sourcing from legally deforested land. The companystates that “Bunge continues to engage with potential investors and partners to develop incentive programs that will encourage and reward farmers for avoiding deforestation and intensifying agricultural production on existing lands.” Bunge is in the process of developing a financial incentive program that encourages and rewards suppliers who avoid deforestation and instead intensify agricultural production on existing farmlands. COFCO has a soy-specific policy. Its Supplier Code of Conduct requests to “[u]se good environmental practices that avoid deforestation and protect against conversion of natural and critical habitats leading to a loss of biodiversity.” This does not explicitly exclude all deforestation and natural habitat conversion. Brazilian producer and trader Amaggi states that “[…] it does not carry out conversions of native forests for the agricultural use. […] projects and partnerships to encourage responsible production by producers are signed annually to promote the Business Principles for Food and Agriculture, of the United Nations Global Compact, as well as the fight against illegal deforestation.” It does not specify whether its own commitment covers the conversion of secondary forests and other valuable habitats, and does not exclude legal deforestation by suppliers. LDC states that it has launched “[…] global and cross-platform Non-Deforestation, No-Peat, No-Exploitation commitments” in 2016 and has announced a soy-specific policy for 2017. No details beyond palm oil-related commitments are available yet. In the sector’s existing policies, exclusions tend to be vague and legal deforestation and conversion of natural habitats in supply chains is still largely accepted. Definitions of natural habitats differ or remain ambiguous, leaving uncertainty about what is accepted. This is of crucial importance as conversion in the Cerrado and other unprotected habitats is not excluded under a policy that only excludes illegal deforestation, conversion of primary forest or tropical forest. The conversion of High Carbon Stock (HCS) and High Conservation Value (HCV) areas for soy is not specifically covered by several of the analyzed companies. It is important to note that this is one of the areas where palm oil-related commitments by the same traders tend to be considerably further advanced. This is also the case for the exclusion of human-induced fire for land clearing, an issue that receives attention in palm oil policies but is largely neglected for soy, despite its prevalence in Brazil and other South American countries. None of the analyzed traders received full points for transparency and traceability of supply chains. ADM, Cargill and Bunge are reporting on progress to map their soy supply chain. However, this is limited to overall figures on the traceable share mapped thus far, but does not provide transparency on supply chain partners up to producer level. Amaggi also states that it knows its supply chain partners, but does not publish details. The highest average scores can be observed in relation to human and labor rights. The elimination of forced and child labor is included by all analyzed companies. Comparatively high scores are also achieved on the implementation of fundamental labor rights, the obligation of the Free, Prior and Informed Consent (NASDAQ:FPIC) of affected communities and the availability of a grievance mechanism. Sanction mechanisms for policy breaches have been identified for five out of the six traders. However, the effectiveness of sanction mechanisms is highly dependent on the policies against which they are applied. They are only as strong as the policy commitments that they are based on. For example, Bunge blocks farmers from its Brazilian supply chain in cases of violations of labor and deforestation regulations, including the Amazon Soy Moratorium, if sourcing from areas embargoed by the environmental authority Ibama, or when breaching the Pará Protocol that aims to prevent illegal deforestation. These criteria thus do not account for deforestation in large parts of the Cerrado, as land conversion there is still mostly legal. The soy producer SLC Agricola has been found to have cleared a total of 39,887 ha of land from 2011 to 2017 of its original vegetation. Of this, more than 30,000 ha consisted of vegetation classified as Cerrado forest by Brazil’s Ministry of Environment. The Round Table on Responsible Soy (RTRS) has recognized these areas for their high biodiversity value. 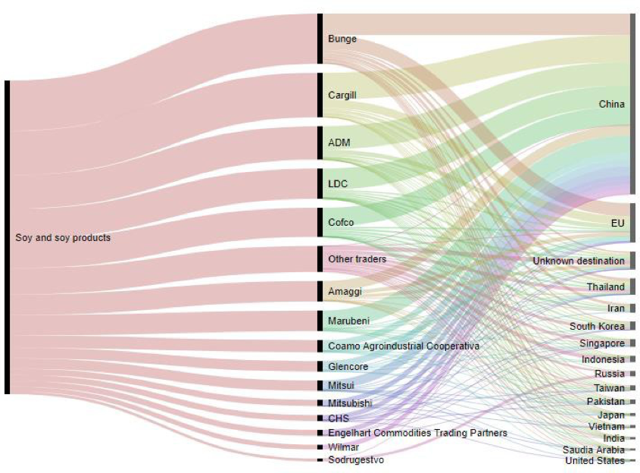 Key clients of SLC Agricola include traders Bunge and Cargill. Brasilagro, another leading soy producer, has deforested 21,690 ha of Cerrado vegetation between 2012 and 2017. Key clients of Brasilagro include traders Bunge, ADM, Amaggi and Cargill. In February 2017, investigations by civil society group Mighty documented the involvement of Bunge and Cargill in Cerrado deforestation for soy, and linked Cargill to Amazon deforestation in Bolivia. In the Brazilian state Piauí, one of the last frontiers of the Cerrado that is marked by a rapid loss of forest and savanna due to farmland conversion, Bunge is the dominant buyer and trader of soybeans in terms of storage and processing capacity and infrastructure. Between November 2016 and October 2017 alone, at least 15,000 ha of land were deforested for soy expansion in the catchment area of Bunge’s facilities. The soy sector is lagging the palm oil sector in terms of the amount and scope of zero-deforestation commitments. The relation between palm oil production and deforestation, peatland conversion, and human and labor rights issues in Southeast Asia has received broad attention in recent years, leading to a quickly increasing number of NDPE commitments. A recent study by Chain Reaction Research found that 74 percent of Indonesian and Malaysian palm oil refining capacity now is covered by zero-deforestation commitments. In a Manifesto published in September 2017, civil society groups urged immediate action by companies that purchase soy and beef to eliminate deforestation and conversion of native vegetation in the Cerrado. In November 2017, the China Meat Association (NYSE:CMA) and 64 Chinese company members together with WWF announced the Chinese Sustainable Meat Declaration. Since China is the recipient of two-thirds of Brazilian soy exports, an implementation of this commitment to avoid land degradation, deforestation and conversion of natural vegetation in livestock production and feed value chains could put significant pressure on soy producers and traders to improve their sustainability performance. In November 2016, a large coalition of indigenous peoples, traditional community groups, family farmers and civil society organizations from different countries called for a Cerrado Moratorium to stop the further advance of agri-business in the eco-region. Considering the key role of the large soy traders in the global soy supply chain, it is highly likely that they are also linked to consumer good companies and retailers that endorsed the Cerrado Manifesto. Traders form an important link between upstream soy producers and customer-facing downstream companies. The recent developments further increase the pressure on traders to strengthen and broaden their sourcing policies to apply across different agri-commodities and to eliminate any deforestation from their supply chains beyond simply tackling illegal deforestation. Similar public attention to the devastating effect of soy production in the Amazon Biome and commitments by leading consumer goods companies and traders led to a broad group of stakeholders agreeing on the Amazon Soy Moratorium in 2006. A comparable agreement for the Cerrado becomes more likely in the current situation. Soy producers involved in deforestation that have supply relationships with traders that already have a kind of zero-deforestation commitment in place face the highest risk of losing customers for their harvest. Traders have more exposure to customers and investor pressure, and are therefore bound to act against suppliers that breach their sustainability commitments. These traders may take measures to exclude products from recently converted farms, or even suspend all trading relations with implicated producers over deforestation concerns. This risk may be lower for the subsidiaries of multinational Japanese corporations that are involved in all stages of the supply chain, from upstream production to midstream trading and processing, to downstream consumer products. However, if not taking action on developing and implementing strict environmental and social sustainability standards in the soy supply chain these companies face the risk of becoming laggards and therefore face reputational risk. At the same time, soy producers face the risk of overvaluation of their land portfolio as the business model of converting land for appreciation may no longer be viable if the land cannot be used for crop production. The technological possibilities for civil society to identify deforestation and link it to specific producers and their customers are continuously improving and becoming increasingly real-time, including tools like Global Forest Watch. Given that 50% of the soy market (using export figures as a proxy) is governed by some form of zero-deforestation commitments, and the Chinese meat industry, as one of the key consumers of Brazilian soy, has also made a zero-deforestation pledge, it is reasonable to expect that the market for unsustainable soy will shrink. It will prove increasingly difficult to find buyers of unsustainable soy. In the process of transition toward 100% deforestation-free soy, different stakeholders (producers, traders, and investors) may experience different risks from loss of customers, to increased costs and lower market value. These risks can have different likelihoods and severity. The precursor for experiencing risk is that one party or stakeholder in the soy supply chain already has advanced sustainability requirements, which the other party violates. Preliminary analysis shows that traders have the most advanced policies, followed by some of the key investors, while the producers are the laggards in terms of sustainability policies and practices (this issue will be examined further in a forthcoming paper by Chain Reaction Research). The paragraphs below give examples of different scenarios and high, medium and low probability risks, presented in context to illustrate their potential materiality. Major risks: loss of customers or stranded assets. In some geographies, there are only one or two major traders present, which form a very limited buyer base for the local growers. If these traders implement strong sustainability policies which the producer violates due to deforestation, the latter would be running risks which can have major financial impacts. This is the case for BrasilAgro and SLC Agricola as well as multiple small to medium soy growers. They risk losing a large part of their market and revenue unless they comply with the zero-deforestation commitments of their customers. The alternative of shipping soy to a replacement buyer is too costly to be viable, therefore the producers are likely to either shift towards more sustainable business conduct or lose revenue. Taking step towards sustainability entails stopping any development on forested lands, thus recognizing them as stranded assets. Medium risk: logistics expenses, storage costs, financing costs increase. In the event of a producer violating the trader’s policies, the trader may sever business relationships. However, the grower may find a replacement buyer – likely within the same financial quarter, albeit at worse terms. It is possible that the cost of shipping or storing the soy will increase. In this process, however, the grower has a window of opportunity to adjust and comply with stronger sustainability policies. This is a likely outcome if the market of deforestation-linked soy shrinks. Alternatively, the growers may also face pressure from banks, which also have sustainability policies – perceiving the grower as riskier may result in higher financing costs as well. Low risk: reputational damage. If the grower sells to its parent company, as do several Japanese and Brazilian producers, their risks do not lie with loss of customers or increased costs, but with reputational damage and receiving a laggard status. This in itself can have a negative impact on share prices. Medium risk – loss of customers and reputational damage. It is possible that consumer goods companies and other downstream clients in the soy supply chain will demand that major traders abide to high sustainability standards, threatening to otherwise sever business relations. This creates a material risk, especially given the first zero-deforestation pledge from key Chinese customers and the relative size of the Chinese market for Brazilian soy (67 percent). However, this is a more remote risk, as a substantial part of soy trade is not directly linked to customers that have a zero- deforestation policy. Soy meal passes through several types of companies which are not consumer facing, such as compound feed producers, livestock producers, and dairy products. This risk is perceived as medium, as most traders can respond and adjust to sustainability pressure more swiftly than producers (for whom this can be a major risk). Nevertheless, reputational damage could have lasting effects for future business relationships or stock price returns. Low risk – increased refinancing costs and refining overcapacity. Traders are exposed to international investors that sometimes have stronger policies than local investors and are therefore more susceptible to pressure by them. For example, Bunge’s creditors have a relatively high sustainability score on average regarding deforestation, and may disengage with the trader over non-compliance or engage with Bunge demanding exclusion of legal deforestation as well. Bunge could easily find replacement funding, but this may come at higher cost. Furthermore, many storage and crushing facilities and refineries are built with additional capacity to accommodate growth. But especially in locations where no zero-deforestation growth can be secured, this overcapacity is likely to remain unproductive. With the increasing likelihood that expansion of cultivation on forested Cerrado land will no longer be accepted, Bunge’s underutilized facilities are not likely to reach full capacity and realize their value. Non-performing loans and reduced interest income: It is possible that the investee of a certain bank may not be able to meet its financial obligations or service its debt properly because of revenue loss, due to loss of customers. It is still likely that a bank can collect its debt, but collection might be delayed. Such delays lead to underutilized bank funds and risks unearned revenues, which can translate to reduced interest income. Furthermore, it is possible that a bank is underpricing the loans it gives to unsustainable companies, due to not being fully aware of their risk exposure. Reduced access to funds and reduced solvency position: Each bank is not only an investor but it also an investee, needing international finance to function. Banks in developing countries often seek funding from developed countries’ banks. The latter are more likely to have high sustainability policies and practices in place and can therefore disengage with a bank investing in unsustainable practices. This may drive up the cost of capital for unsustainable banks. Reduced revenue, reduced interest income, or reduced access to funds can all have a negative impact on solvency ratios. Compliance with regulatory requirements regarding solvency may also be at risk. High risk – Lost value for equity investors: the stock market reacts more and more to news related to sustainability, reputation and brand value. Poor sustainability is also a signal of potentially outdated and stagnating managerial position, or inability to address risks. Equity investors should expect share price volatility, and under- performance. This has been the case for palm oil companies and multiple other studies confirmed the trend (e.g. a German meta study of 2,250 academic studies found a positive correlation between sustainability and performance in 63 percent of the studies, a negative correlation in only 10 percent; further example here). Stranded assets can result in substantial share price revaluations and loss of value. A brief description of the potential financial impacts of the above-mentioned risks follows. These effects include cost increase or profit loss. Cash flow cycle can also be adversely impacted, and the recognition of potential stranded assets could also lead to both profit impact and shareholder value loss. Leverage can also be negatively hurt. Several scenarios are estimated and presented, and the downsides are compared with the opportunities brought by sustainable soy. Reduced revenue: suspensions by customers over supply chain violations can lead to temporary loss of revenue to both traders and producers. Especially when soy producers are contingent on a few significantly large customers, one of these may sever procurement relations over sustainability violations. This can result in loss of revenue and compressed profit margins. For example, soy producer BrasilAgro may be risking 26 percent of its revenue if it violates the zero- deforestation policies of its customers. Similarly, commodity traderBunge may be pressured by the members of the Consumer Goods Forum – which support the Cerrado Manifesto – to exclude legal deforestation from its supply chain. This could cause a ten percent decrease in its revenues. Finding substitute buyers takes time and may be at worse delivery terms. Drawing a parallel with the palm oil industry, it could take three or more months or to find a replacement buyer (according to CRR research). Thus, one reporting quarter may show significant decline in the financial performance of the growers and traders. Increased operating costs: in the case of loss of customers over supply chain violations, a grower or trader would likely be left with unsold inventory, and may incur additional storage costs. Furthermore, as certification for sustainability gets more popular and stakeholder pressure rises, it becomes more likely that companies will be required to obtain and comply with some form of certification, such as RTRS or ProTerra certification. Other examples are the implementation of Free, Prior and Informed Consent (FPIC) of affected communities, or the implementation of NDPE policies. Compliance can be costly, as it requires financial outlay, time investment and knowledge build up. One example of this is Sime Darby, which had unforeseen expenses for obtaining FPIC for palm oil plantations from local communities in Liberia. Furthermore, land restoration expenses can add up. For example, if restoration policies are introduced as in SE Asia,BrasilAgro could face restoration amounts of 29 percent its equity value.Further costs may occur in the event of disputed land ownership by local communities, including strikes or stop work orders that can delay harvesting or production, reducing the efficiency of the company. Sime Darby’s operations in Liberia were delayed for four years in the process of securing FPIC, putting off any cash flows well into the future. Increased financing costs: if credit investors perceive unsustainable companies as riskier, which is warranted in the scenarios described above, they may increase the required interest rates, or cost of debt. An example is Bunge, which has seven out of ten creditors scoring more than three out of five points in the Forest 500. These investors can be inclined to consider engagement towards higher sustainability. For highly leveraged companies, the alternative of more expensive debt can have significant impacts. Reduced profit: given that some soy producers have high operational leverage and high fixed costs, each of the financial risks mentioned above could result in profit suppression. (Several palm oil companies have experienced steep losses in similar circumstances). For example, if SLC Agricola were to lose its major customers as they implement deforestation commitments that also cover legal deforestation, it could suffer nearly 50 percent profit reduction. This in turn impacts negatively on return on assets and return on equity. Worse cash flow cycle: making a parallel with the palm oil industry, losing a customer can also impact the cash flow management of a company. Finding substitute buyers often results in worse payment terms (longer days sales outstanding – this occurred to palm oil companies Sawit Sumbermas Sarana and Provident Agro that violated supply policies) and thus less available cash. This impacts the short-term liquidity of a company. If it coincides with other planned or unplanned cash outlays, it may lead to borrowing additional operating funds at higher cost. Stranded assets: Soy producers may buy new forested land planning to clear the forest and expand, only to discover that this is impossible. For example, SLC Agricola owns 42,000 ha of such land in the Cerrado that may end up being undevelopable. (Similarly, 30% of the palm oil land in Indonesia is also stranded, and companies cannot develop it as a majority of the market is only buying zero- deforestation palm oil). Purchasing this land was a capital expenditure, and money was spent on a bad acquisition. Such land can bring no future cash flows; it cannot be a source of growth or unlock equity value for the investors. It may eventually have negative ROI (return on investment) and represents poor collateral.A trader can also suffer impairments of its assets due to deforestation. For example, Bunge has seven percent of its facilities (crushing mills, refineries, packaging, etc.) in the Cerrado’s region Piauí. As these are usually built with over- capacity to accommodate growth, there is a possibility that they never utilize their full capacity if Bunge would not be able to grow in this region of the Cerrado, and their current value would thus be impaired. The impact of a 30 percent book value reduction of the Cerrado’s Piauí assets can be translated to a 0.5 percent decrease in net asset value per share, or 0.3 percent of the share price, as they can generate less-than-expected cash flow. Reduced Free Cash Flows: considering the reduced revenue, potential cost increase and lowered profitability, together with capex spending and fixed depreciation outlay, any free cash flows a soy producer generates will also be lower than expected in the event of customer loss. In a worse-case scenario, agri-land and agri-assets may produce no free cash flows in the future (if there is a deforestation ban in the Cerrado, like the Amazon moratorium), or cash flows can be significantly delayed in the event of e.g. social cost like FPIC. The effect of that is reduced present value of the investment and the company, be it a grower or a trader. If EBITDA is used as a proxy for free cash flows, in a scenario where signatories of the Cerrado Manifesto stop purchasing from Bunge, revenue loss can translate into EBITDA decrease of USD 0.2 billion. Reduced fair value of land assets: revaluing a land asset which was considered productive to a land asset without free cash flow means writing off part of the property, plant and equipment account of the balance sheet. If the fair value of the land asset is decreasing, this decline has to be expensed from the income statement as an impairment charge, further lowering profits and total assets. In the case of SLC Agricola, potential reduction of land-related free cash flows translates into reduced net asset value; similar to the Bunge scenario. Increased net debt / EBITDA ratio: if one of the scenarios described above develops and there is a negative impact on EBITDA, which is also a proxy for free cash flows, the company will have reduced liquidity compared to its prior performance and its competitors. Its borrowing capacity will also be impacted, and cost of debt may rise. Lower share price: due to volatile revenue, reduced free cash flows, stranded assets and worsened liquidity position, it is possible that the equity value of growers and traders may also decrease. This means that the share price may experience a sudden temporary drop, as in the case of a temporary loss of revenue. This is what happened to palm oil producers Sawit Sumbermas Sarana and Provident Agro. It is also a plausible scenario for BrasilAgro. In this case stranded assets could see a fundamental loss of value, such as Bunge’s Cerrado’s Piauí facilities churning 1.2 percent off its share price. Premium for certified products: soy products certified under a recognized standard that leads to improved sustainability performance sell at a premium, with the share of the premium depending on the stringency of the relevant standard. Subsidies or cost savings: with the take-off of sustainability initiatives from various stakeholders (like the ‘Statement of support for the objectives of the Cerrado manifesto’, Chinese sustainable meat declaration) it is very likely that more and more subsidies and other stimuli will be offered to produce zero- deforestation soy. At present, there are already initiatives offering services like know how and training regarding sustainable production, for free or reduced fee (e.g. Round Table of Responsible soy, RTRS). Brand value can be enhanced: research in the developing countries produced results showing that the millennial generation is seeking more sustainable products and is ready to choose its service providers based on their sustainability and climate awareness. This suggests that consumer goods companies could benefit by demanding more sustainable products. Other research has also shown that companies can enjoy a wider and more loyal customer base by developing a sustainable image. Retention of clients was also improved (source: RSPO paper, unpublished). Lower cost of debt and cost of equity: other commodities show that there is a positive correlation between levels of sustainability and better finance terms. It is likely that the soy market will develop in similar way. Leadership position: access to green finance as well as better reputation can establish the early adopters of sustainability as leaders in the market. Higher stock price returns: studies have shown that sustainability indices perform statistically better than conventional (e.g. Morningstar’s study showed that 16 out of 20 sustainable indices outperformed conventional). The difference of share price return is material. SLC Agricola as an example, might “increase the institutional investors’ confidence in its management and actually reduce the company’s equity price discount vs its NAV per share” by complying with zero- deforestation. Recent developments in the soy sector suggest a high likelihood that soy market risk and connected financial impacts may start to materialize within a short timeline. Awareness of the continuing deforestation risk in soy production and its environmental and social implications outside of the Amazon Biome is rapidly increasing. A lack of action by soy producers to avoid deforestation in soy production may lead to increased risk of losing market access, resulting in adverse financial impacts. These can range from revenue impact, to cost impact, to negative impacts on profit as well as share price reductions. Illegal deforestation directly risks market access to traders that have adopted zero- deforestation policies, whereas legal deforestation is a potential future risk. Parallels can be drawn with the developments in the Southeast Asian palm oil supply chain as a similarly important oilseed connected to severe environmental impacts. Material risks and the associated consequences of low sustainability performance were experienced by several palm oil companies in recent years. Soy producers can mitigate the risk of losing market access by limiting soy expansion to already converted ‘go-areas.’ To mitigate further material financial risks, the processors and traders of soy as influential actors in the value chain may take steps to exclude any kind of legal and illegal deforestation from their sourcing. While efficient sanction mechanisms to engage and eventually suspend suppliers that are non- compliant on social and environmental requirements still have gaps in relation to legal deforestation, downstream pressure may change this soon. 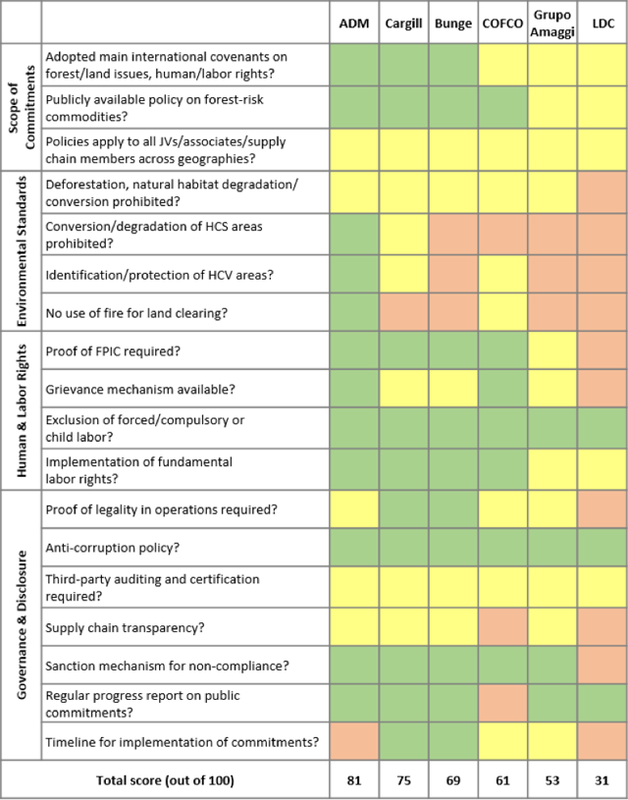 The overall picture shows diverging definitions of deforestation used by the companies, difficulties to meet commitments made, and an overall lack of an accepted benchmark to measure progress made. Broad stakeholder input is currently sought to develop an accountability framework that sets and implements effective commitments, monitoring and reporting standards on deforestation, land conversion, and human rights in responsible supply chains. This process offers companies an opportunity to manage and avoid sustainability and financial risks based on broadly accepted criteria. The scoring of the sustainability policies of the top soy traders and processors in Brazil is based on publicly available company documents. Information was accessed online in November 2017. Figure 6 shows the scoring criteria and underlying definitions. The assessment specifically focused on commitments relating to the soy supply chain. No points were assigned e.g. for commitments solely applying to the palm oil or forestry sector. Inadvertent omissions of statements or commitments cannot be fully precluded. Please contact us in case of comments or corrections. covenants. Signatory to or participant in some relevant treaties or covenants. Signatory to or participant in several relevant treaties or covenants. guidelines. Has a forest-risk policy considering soy. described. Not applied to all relevant supply chain stages and geographies. Explicitly applied to all relevant JVs, suppliers and geographies. covenants is not sufficient. Explicitly described in policy. sufficient. Explicitly described in policy and applied to all their business. requirements. Explicitly described in policy. players. No such policy. Yes, but very general/vague Explicitly described in the policy. scheme standards.7 No such policy. Yes, but only part of their activities. Explicitly have such policy that covers all their business activities. business. Full transparency on supply chain. reported within established frequency. None ad-hoc Established frequency. coverage. Timebound plan for NDE. Figure 6: Criteria analyzed in ESG policy analysis. 1 Relevant covenants include UN Guiding Principles for Business & Human Rights, OECD Guidelines for Multinational Enterprises, UN Global Compact, IFC Performance Standards, The 8 ILO Core Conventions, UN Declaration on the Rights of Indigenous Peoples (UNDRIP), UN Forest Principles, Soft Commodity Compact, New York Declaration on Forests. Specific for Brazil: Amazon Soy Moratorium, Pact for the Eradication of Slave Work in Brazil. (1 point for 2 or 3 adoptions; 2 points if at least 4). 2 e.g. Beyond Tier 1, not restricted to Amazon Biome. 3 Natural habitats refer to natural forests, encompassing primary forests as well as naturally regenerated secondary forests (FAO), as well as other regions identified as valuable eco-regions due to high biodiversity and carbon storage. 4 For more information on HCV and HCS forests, see: The High Conservation Value (HCV) Resource Network; The High Carbon Stock (HCS) Approach. 5 No resettlement of people who are dependent for their livelihoods on land affected by the operations without their FPIC. Relevant guidelines include UN Declaration on the Rights of Indigenous Peoples (UNDRIP); Convention on Indigenous and Tribal Peoples (ILO-169). 6 This may entail verifying legal title to the land and acquisition of all relevant permits and approvals, exclusion of Ibama-embargoed areas. 7 Considered are RTRS and Proterra certification standards.